I just want a light cap, made out of stuff that has a bit of stretch, that looks ok. Or decent looking team caps that are bigger than the one-size-fits- all from Prendas. 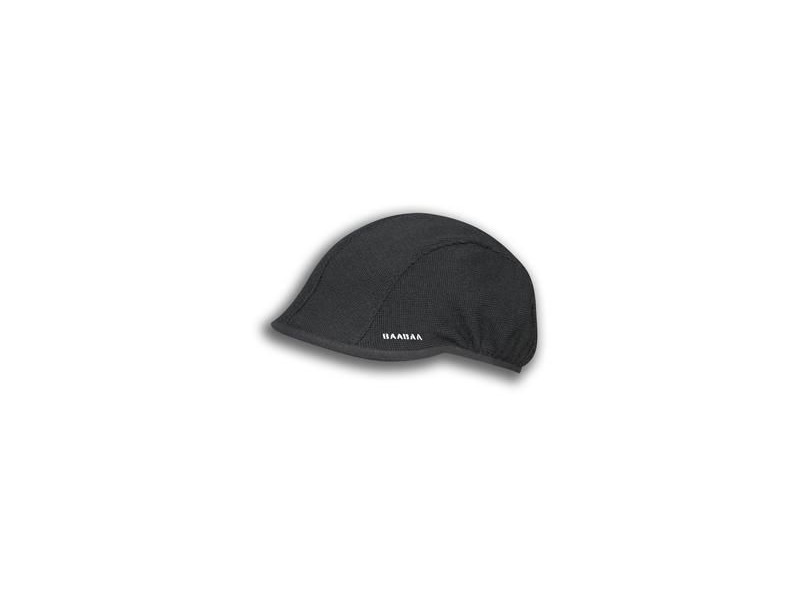 I bought myself a Rapha cap early last year. I also have a large head, and normal caps are always tight on me, leaving a line across my forehead when removed. The Rapha in Large fits me nicely, without that problem. Mine's a Paul Smith variant (now discontinued) but I think that's just a colourway difference. I have a large Rapha , and it isn't too bad across the forehead, but still not quite right for me. I think it has shrunk a bit, maybe. I'd like to be able to wear a very thin Sweatvac hat under the cap to cover my ears when it's a bit chilly, so more room or a bit of stretch is required. I was just thinking about this myself, most cycling caps are a bit small for me. Dunno what it is about Assos stuff, but the way the models pose in their kit always reminds me of a Kraftwerk album cover! Nice to know there are some fellow cap wearers out there too, upholding standards and cutting a dash (says someone who sports a small faded black Rapha and club biretta). The Rapha / Paul Smith ones (how good is that? Two fashion victim names for the price of one) are extremely nice and beautifully crafted. If you find one anywhere, I'd snap it up. I had a Rapha in L; it was still too small for my massive bonce. I had an Assos Mille and cut the elastic out of the back. That was okay, if a little tight. I have a Craft summer cap, similarly with elastic removed. That fits me okay, but sadly they don't make them anymore. I had an orange cap that I got for £3 at the CTC rally, rather like one that Arabella owns. That fitted me fine (you guessed it - with elastic removed) but I lost it. Finally, I bought a Castelli cap in Belgium this year, it fits me perfectly and I haven't even had to get my scissors out! I was just saying to Jurek that the Assos Raincap photo above put me in mind of the Pet Shop Boys. I quite like that about Assos, that slightly contrived advertising. That reminds me, a normal Assos cotton cap is not too bad size-wise. My black one is totally washed out and seems to be going purple in parts. Can't find the equivalent available to buy right now. I had one of those once upon a time, but it was a bit small even with the elastic removed. The Mille seemed to be a little bit bigger. My Rapha caps are the only ones that don't blow off my head on the Severn Bridge never to be seen again. However Mine if probably the opposite problem, getting caps small enough not to fall off! TGL mostly wears his LCEF cap, which is pretty good quality. Winter headwear has more options than warmer weather headwear. If nothing goes wrong, I go wrong. Sadly, melancholy doesn't pay my rent. In the winter I wear an Endura Baa Baa skull cap ( no peak ) and that is lovely. It keeps my head warm and even when I stop and it is wet my head does not get cold because the merino wool stays warm. However, in the warmer times I wear a cap to stop the sunburn and also to keep the sweat out of my eyes. I have always used cotton type caps but the biggest drawback is the smell of them ( after a couple of weeks of use ). That last Mavic one looks interesting but it also looks quite warm. I also used to buy any old cap, but found they shrank after only a few washes and end up being so tight I get headaches (pressing on a nerve I suppose). I read somewhere that Campagnolo caps were made of better material and didn't shrink so I bought a couple off ebay for £15. I marked one on the label to make sure only one was regularly washed - and yes, they don't shrink nowhere near as much. It's getting a bit tight now so I'll retire it at the end of the winter (it's been washed twice a week for 2 winters). The Campagnolo logo and rainbow stripes are cooler than anything that Rapha can even dream about. Assos ones have been good as well, but more expensive and not as durable. Totally agree on the shrinking. My yACF ones were terrible for that and they were only washed with all my other cycling clothes. The Assos ones have the mesh at the rear and that somehow seems to get tight after the wash but soon stretches again once on. It is not a warm cap, made out light cycling jersey fabric. I also wear it as a rain shield for my glasses. I like the style of the Campagnolo ones, but they are just a fraction tight for me (I wore them pretty much exclusively for a few years and have three different colours). For shrinkage, I handwash my caps in warm water, which keeps them clean and sweet smelling but doesn't make them shrink (or have the peak going soft and then setting in a strange shape when cooled down). If somebody came out with a classy-looking, cheap and cheerful cap in quality non-shrinking cotton (like Campagnolo or Assos) in 3 sizes (S, M, L) they'd be on to a winner. Walz look as if they might do the job. Will take a tape measure to my head later. Every year at the Cheshire Ploughing and Hedgecutting competition a firm called Environmental Crop Management http://www.ecmltd.co.uk/ hand out free baseball caps to the hedging competitors, I get one of those and cut the peak down with a pair of scissors. The old ones say 'Profitable Crops Safely' on them. Cycling caps are too small, baseball caps are adjustable. I got one of their Campag ones, appears to be cotton, washed it several times, doesn't appear to have shrunk or stretched - and never blown off my head yet. I think I'm just below average head circumference but not sure. Page created in 0.065 seconds with 25 queries.